interesting that the racing clubs are having a fight with RV over night racing and it will be them that decide whether we have night racing at Caulfield or not. We do not have a say in the matter! how about they close Caulfield and turn it into a park and keep Moonee Valley open! I’m speechless, and when is the action on The VAGO recommendations going to happen the year 2050 if at all. I agree entirely. Nothing in this letter shows any progress on governance issues, on the mrc paying some decent rental, and the almost forgotten land management plan is now a thing of the past since the Age’s article yesterday. I do not know how Neville can say that a governance framework includes the trustees not publishing their agendas or minutes and therefore what’s the point of councillors reporting back to council when they can’t even say who moved a particular motion. This is a total, disgraceful farce. I also like the sentence where Neville says that councillor trustees are there are community representatives. What’s happened to the Lipshutz, Hyams, Esakoff and Newton claims of the past? All are a disgrace from the Libs, Labor and councillors. Kick these liabilities out. What are the six councillors doing? Warming up seats? Andrew Daniel should have replaced the three councillors immediately as Glen Eira residents are deprived from chronic lack of sport grounds. Queen’s gift to the people has been snatched by Caulfield Racecource while Council’s trustees are there to enjoy the perks at the cost of ratepayers. 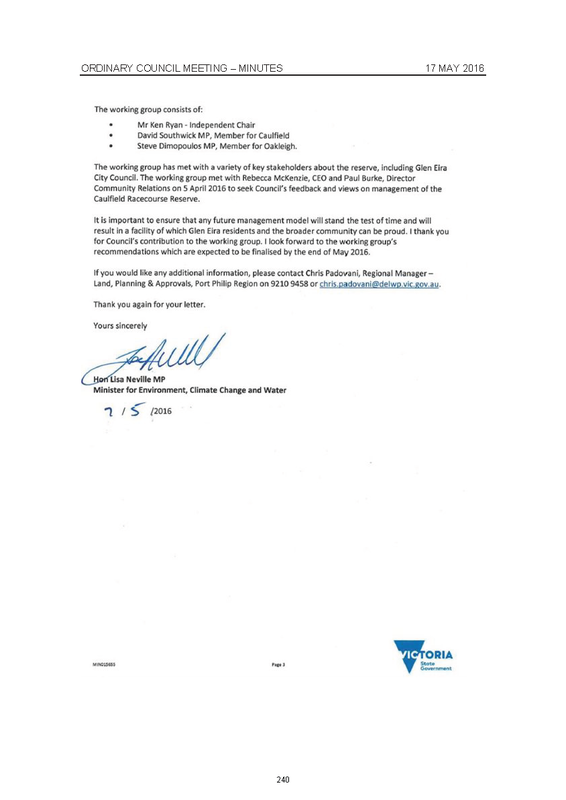 One sure thing is that Daniel Andrews will be enjoying the hospitality of the MRC watching the Caulfield Cup. The MRC will get their second track to have extra meetings after they sell Sandown for housing. (about 280 acres) The VRC redeveloped Flemington by selling the old Mentone track. The MRC will needs to upgrade all the training facilities which will leave little room for any community sports grounds. The Government will say we gave you the reservoir site now shut up and be grateful. Mrc is a juggernaut that keeps going and going til they get the whole lot. Neville will assist by getting rid of the crown grant and that means 150 years of something for the public at least on paper is gone. The letter from Ms Neville is hardly reassuring. Far from improving governance, most decisions are being made in secret, without transparency or accountability. The A-G’s Report criticized not just CRRT but the Department too. Negotiations concerning governance are between the two parties most heavily criticized. Little wonder meetings are still closed and without comprehensive public Minutes. There is still no clarity about what CRRT is supposed to achieve and what an appropriate balance between the competing interests for the land might look like. The Government has not formally responded to the Report either. Instead We only learn indirectly via the letter that the Secretary has written to the Auditor-General accepting all recommendations. If GECC can be believed, there is no such thing as a Glen Eira City Council Trustee. Councillors formally rejected last year the notion that the Trustees who are councillors represent GECC. 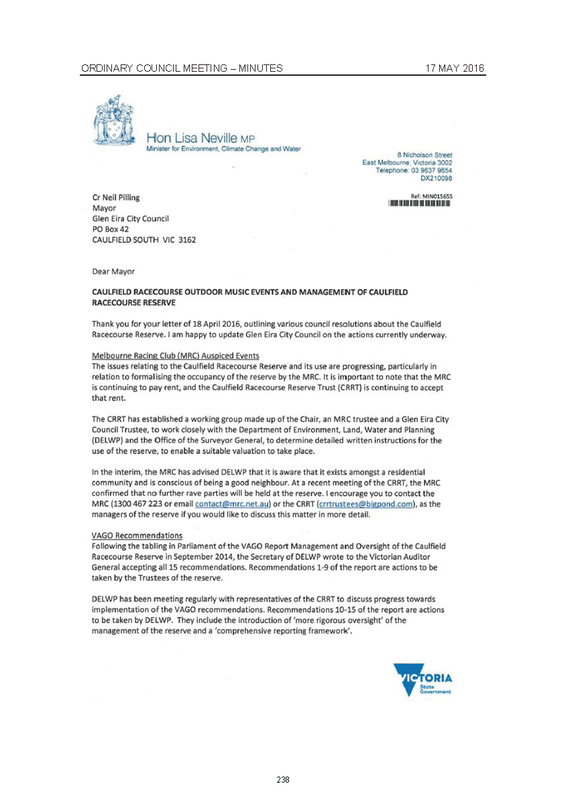 In their view, CRRT and its management of the racecourse reserve is NOT Council business. We know this because they have deemed public questions on these topics to be inappropriate under 232(2)(j)(ii) of Local Law. The Crown Grant is explicit that the councillors are representatives of Council, so Council’s response was inappropriate being a breach of their own Local Law. Despite this, at least the Minister claims the Trustees are free to discuss matters relating to the CRRT unless it is of a confidential nature. Unfortunately, everything CRRT does is deemed to be of a confidential nature. We don’t know what the legislative instrument is that would prevent reporting of matters discussed at CRRT—the Minister couldn’t be bothered disclosing that. MRC might be paying rent but why so little rent? And why does MRC get to use so much land without a lease and without paying a rental? Shops go out of business or relocate when they fail to negotiate mutually agreeable rental or lease payments with their landlords. I don’t see how Rebecca McKenzie or Paul Burke could provide Council’s feedback or views concerning management of the reserve unless there was a resolution establishing what Council’s views are. Council staff are not members of Council. There are a number of reports in today’s media regarding the future of the Melbourne Racing Club’s racecourses at Caulfield and Sandown. The club announced over two years ago that we were developing a Master Plan for Caulfield and Sandown. This was a prudent course of action to canvas the opportunities for the two racecourses and allow planning for their future – all built upon the premise of the long-term sustainability of the club, and benefit to members. The Master Plan continues to be developed and discussions have been held with State Government and Racing Victoria regarding key matters which require resolution – particularly long-term tenure at Caulfield. 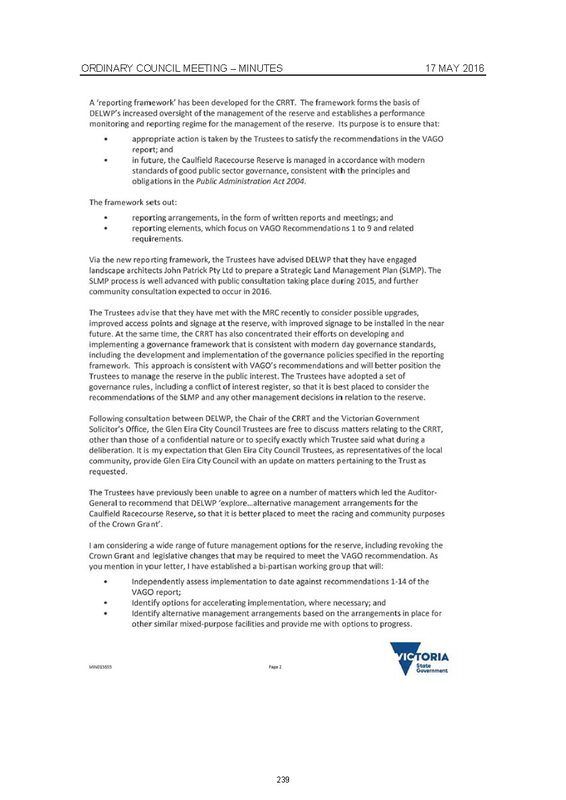 The Master Plan presents a number of options for the future of Caulfield and Sandown, however I want to assure you that no decisions have been made by the club, and ultimately any decision on the future will be made by members. The Melbourne Racing Club is foremost a members’ club and any major decision regarding our racecourses will be done in consultation with members and for the long term benefit of the club. The club’s vision is to provide world class facilities for our members and the racing industry. The assets of the club and any benefits generated from them will be re-directed with your interests in mind. We will continue to engage with key stakeholders including our members, trainers, participants, local communities and State Government regarding our Master Plan. Any future decisions will be made in the best interests of members whilst also achieving the most efficient and optimal racing footprint to ensure Victorian racing remains at the forefront for our customers. Yes the rental fee of for only about a third of the area for only $90,000 plus mowing the grass for the MRC use is a staggering low figure. Mr Symons’ company rents Aquanita Lodge at the south east corner of the racecourse for only about $10,000.00 (Mr Symons present at CRRT Meeting when rental set) and MRC rents another large area (the western stables) to Mr Cairon Maher, a horse trainer, for another fee so the MRC has the quiet enjoyment of the enormous remainder 48 hectares for only about $75,000.00. The cost in round figures is not even $1,500.00 per week for the Melbourne Racing Club. This small figure provides the Melbourne Racing Club with a commercial venue for the Cup Carnival, circuses, film screenings, Monash examinations, the Glasshouse Restaurant, one of the largest pokie (one of the highest earning in Victoria),an extensive TAB facility, trade shows and Offices of administratin for Pagasus Leisure,and loud rave concerts, Fortunately, for the MRC is also receives concessional rents because in Andrew Newton’s words provides a public park facility. Hopefully, this body of enquiry, which of course includes MRC reps. is not given a long lease again. In the interim the government should suggest a larger rental to be charged in the interim to be held in trust jointly by the two parties with the undertaking by govenment that the money be refunded if the valuers happen to find that the MRC had paid too much. The MRC must be laughing all the way to the bank while the current situation exists. The other paart of the bargain for the MRC is the fact that this organisation probably does not have to pay the millions of dollars land tax which any other body would have to pay for a commercial enterprise.